Okay. So this Tokyo Banana variant may not be as popular as the sponge cake edition, but despite of them being infamous and different, they have received a great deal of attention from foodies in the market. The shape and size might be quite odd as well as awkward because they are neither cookies nor sponge cake. The shape is like a sandwich with banana cream filling in the middle, just thinner and crunchier. The texture is rather wafer-like. Imagine a thin-crisp wafer-like snacks with the legendary Tokyo Banana’s cream filling that just melts the moment in enters in your mouth. Very provocative, very intriguing. 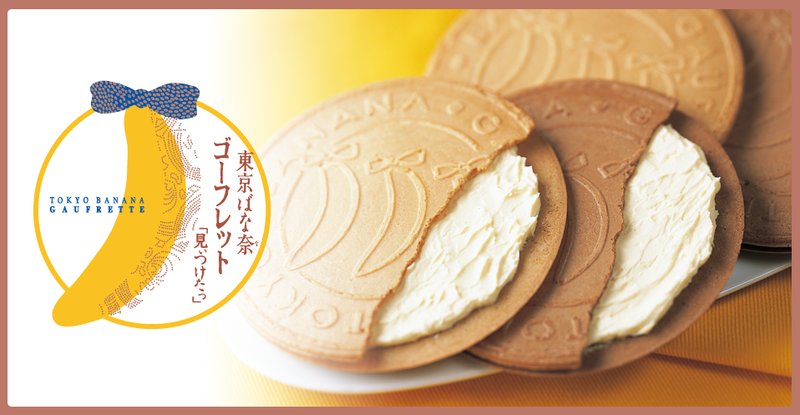 Basically, it’s a thin-wafer-like snack fill with the famous Tokyo Banana Cream that melts in your mouth! sis kalo mau psen gmn? Hello I’m from indonesia… How can I buy this snack from indonesia ? I would like to order Tokyo banana original, caramel flavours and kit ket green tea flavour. Would you be able to ship it to melbourne in Australia? hi, I would like to buy tokyo banana original, and Tokyo Banana Moon Gaufrettes shipping to vancouver canada. Can you please email me the details. Hi, I would like to inquire if you can ship to singapore? Thank you. Hi i would like to buy the tokyo banana with chocolate custard and the layered cake, do you ship to australia and how much is shipping? is the tokyo banana still available for purchase? i would like to buy some. I would like to buy these tokyo banana, but do you ship to USA?? Can you ship to México some Tokyo Banana? Hi can u email me the contact details and how to purchase? Hello, can this ship to Adelaide in Australia? Can you also send me the price list of all the tokyo banana products you have, I am interested in all of them. I would like a box do you ship to the USA?